As politicians in 19 wards across the city seek voters’ approval to represent them for four years on Milton Keynes Council, there’s uncertainty as to whether this means a protest vote on May 2 against the main parties, or whether people will stay at home. Pro no-deal Brexit party, the UK Independence Party (UKIP) believes the wind is in their sails. They have six candidates in the upcoming council poll. Jeff Wyatt, who is standing for UKIP in Stony Stratford, said: “Brexit is on everybody’s lips. Milton Keynes was very slightly a leave town at the referendum and people are very disappointed in our treacherous Prime Minister and the hypocrite Jeremy Corbyn. As well as saying that Prime Minister Theresa May was being treasonous on a Sky TV interview recently, Mr Wyatt believes trust in and support for the Monarchy is being “tested”. “The Queen could step in on behalf of the people against the establishment but she doesn’t,” he said. “I think she is being badly advised by her ministers. “It is a very dangerous time,” he added. As well as promoting the opportunity for electors to ‘send a message to the government about Brexit’, Mr Wyatt says UKIP has a range of local policies, including ending rough sleeping, rejecting huge future growth of MK and supporting businesses. Conservative group leader Alex Walker also says Brexit is an issue. “In wards like mine, residents are really annoyed with the Westminster Brexit mess,” said Cllr Walker. “They blame and are angry with both the Conservative Party and the Labour Party. The Conservatives, currently working hard to defend 12 of the 19 seats up for grabs, say local issues include potholes, homelessness and the environment. “Labour continue to waste millions of taxpayers’ money, not least on the refurbishment of the council offices, £11million and still rising. The fact they’ve failed to address those issues, demonstrates why they need sacking. “There is one big difference this year and that is the debate over the future growth of MK. Labour and the Lib Dems want to substantially speed up and increase housing development, doubling our population in just 30 years, that’s 100,000 new homes. We reject that plan. We want to review that ambition and make it far more sustainable. Labour leader Cllr Pete Marland added that Brexit is an issue. “It is just consuming so much airspace in the national media it would be odd if it wasn’t,” he said. “There is no doubt at all that the Tories are taking a massive hit on the doorstep.” But he believes that the party’s local record puts it in poll position to defend four of its seats that are up for grabs, and make gains. “I think turnout is always an issue for the Labour Party in every election. We are not feeling the same anger towards us on the doorstep but I think our local record really helps us here. “There is always a threat that if you take voters for granted they might vote for someone else, so we’ve spent a lot of time speaking to people to make sure that isn’t the case. Cllr Douglas McCall, the Lib Dem leader, believes any Brexit effect on the doorstep won’t hit the Lib Dems as much as the other parties, especially the Conservatives. The Lib Dems are putting tackling child poverty at the top of their manifesto and Cllr McCall says they will work with other parties to implement their commitments. “We want to see the Foodbank properly supported and the benefits system working properly for people,” said Cllr McCall. The Greens want to see a “radical programme of investment in public transport, housing and renewable energy”. Mr Francis says this will both save residents money in the long run and do our part to tackle climate change. 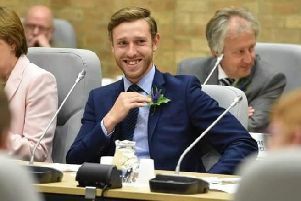 The Green Party does not hold any seats on MK Council at the moment, but they hope that people who are disillusioned with the main parties will turn to their candidates. “Greens are winning council seats all over the country so why not here?” he said.